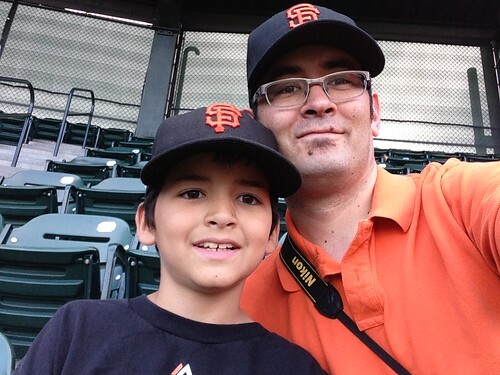 I took my 8-year-old to his first Major League Baseball game last month. He’s caught the baseball bug something fierce and has been jonesing to go to a Major League game for a while. He’s also a Giants fan like me* and I wanted his first game to be at AT&T Park in order to properly set the hook once and for all. *When we moved to New Jersey I told myself that all I could do was try and keep him from being a Yankees fan. The 2014 World Series was a huge help and he’s to-date treated whatever I like is a good endorsement. *Where I used to love sitting at The Stick. *I’m pretty sure if I commuted this would be different. *Yes we parked close to the Bayshore Caltrain station and walked in. We had parked there for the Earthquake game and were home when people were still trying to leave the Candlestick parking lot. Ever since then we stopped parking in the lots. 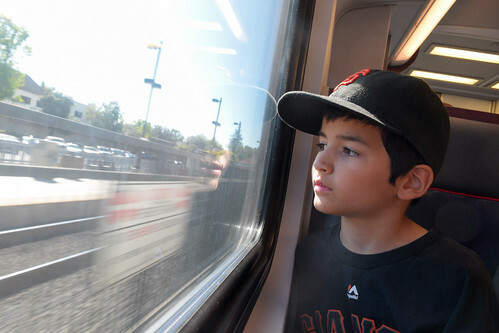 His eyes got nice and wide when I pointed out AT&T Park from the train as we pulled into the station. Once we got off, the short walk toward the park and the Willie Mays statue was full of excitement. He stayed close to me the entire time so I couldn’t get any good photos but I get the sense that it was as wonderful as he’d built it up in his expectations. I figured he’d like walking up the ramp and taking as much in as possible so we skipped the escalator. We’d arrived a couple hours early and I was just going to let him walk around the park and see everything. 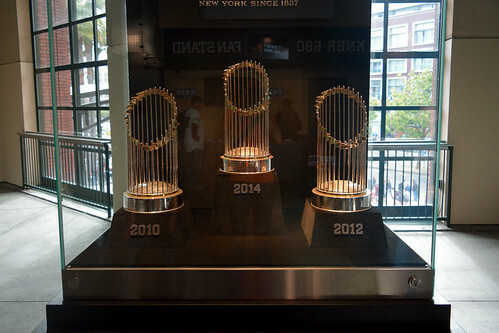 And we did, starting with the World Series Trophies and Rings display. I thought briefly about heading down toward the field since it looked like someone might be signing but that’s always a crapshoot and I didn’t think he was in any mood to wait around and be patient. Just being that close to the field was enough. Plus he wanted to go down the Coke bottle slide and see McCovey Cove. The last time I was out in this part of the stadium was in that first exhibition game against the Yankees in 2000. A friend and I watched the first half of the game; once it degenerated into Spring Training farce we decided that making our way around the stadium would be a better use of time. It was crowded then so I didn’t have a chance to properly look at everything. Much nicer to be able to take my time and see everything and notice the things my 8-year-old was pointing out and getting excited over. He did indeed go down the slide (no line). He also got to walk the entire arcade and check out McCovey Cove. I realized that the bleachers offered a bit of that Candlestick wind experience and was pleased that it still existed. We made our way back to our seats so we could get settled, eat dinner, and be ready in time for lineups. They were high up but exactly what I wanted. You can sit close to the field at any ballgame. Only in the big leagues can you sit up high and get this perspective on the game. I’ve always liked this perspective and the way it allows me to see how players are positioned and where the ball is going while also keeping a perspective on how the pitches look. At a park like AT&T it also afforded a beautiful view of the San Francisco Bay and Oakland Hills. Not only can you see the game, you can see how wonderfully located the park is. 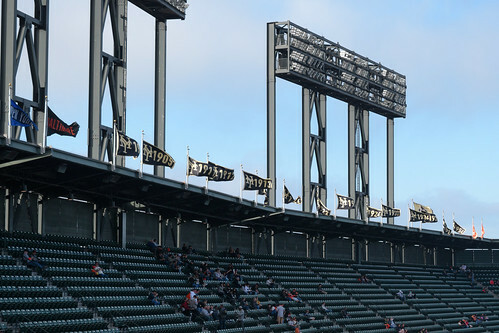 He spent a lot of time looking around and noticing details like how the flags on the left-field side had the Giants pennant-winning years on them (yes he recognizes all those years) and how the flags above the scoreboard featured the World Series wins (yes he can read them). He rattled off who the retired player numbers stood for (I had to help him with Irvin and Perry) and just spent the entire time taking it all in. I’m glad we went up when we did since otherwise he wouldn’t have paid attention to the game. 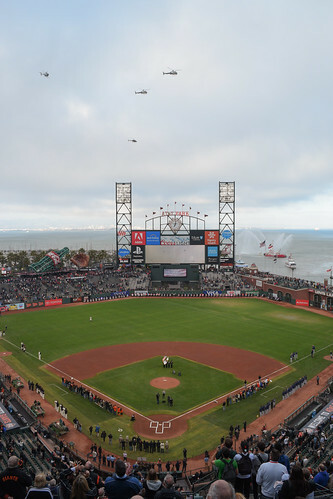 Since it was First Responder Appreciation night we had a festive national anthem complete with a bazillion motorcops, a fire tugboat spraying water, and a flyover by police helicopters. Then it was time for the game. Dereck Rodríguez and Wade Miley both work fast and things were going along nice and quick until we got into the bullpens. I was keeping score and pointing things out like how the teams were shifting batter-to-batter. My son was just watching and paying attention to everything. He was enjoying the tenseness of the game while also getting increasingly nervous about the Giants inability to push runs across. When the wheels fell off and the bullpen imploded, we had a bit of a crisis of faith. He doesn’t do well when things go bad and I had to explain that a good baseball team is one that wins 6 out of every 10 games so even if the Giants are good he should be used to them losing 40% of the time. And I had to explain how we can’t just leave as soon as we think the game’s “over.” Yes I agreed that things were unlikely to turn around. But baseball is one os those “you never know” games and how upset would he be if we did leave and they came from behind. That the Giants didn’t give up and made a game of it despite it “being over” helped a lot too. Was he upset that we lost? Of course. But he saw how just a break here or there could’ve changed things even in the 9th inning when all seemed lost. For me, I’ve not been to a game since maybe 2003 so it was great to actually watch one again. I’m thankful that AT&T is built in a way which minimizes the wind and fog issues that defined Candlestick. 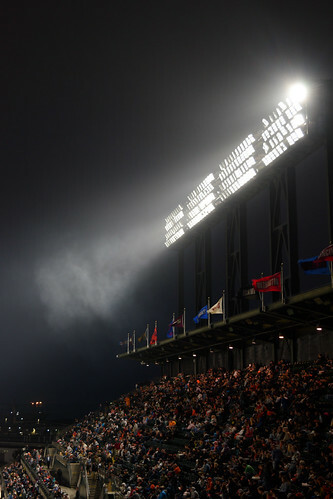 I’m also thankful that we still had fog billowing over the edge of the stands and streaming through the lights. It wasn’t nearly as cold as those freezing nights in The Stick but it was enough to remind me of those nights when we deserved our Croix. We walked quickly back to the train station since the “until full” qualification on Caltrain is a bit scary when half the stadium streams out in the 8th inning but there was plenty of space on the train and plenty of time to spare before we left. He read through the program a bit before falling asleep in my lap around San Bruno. He was excited to talk about everything the following morning and spent the week following the game talking about when he would go next. His current plan is to get tickets for when the Giants visit the Mets since he figures that that’s a game the Giants would be more likely to win. 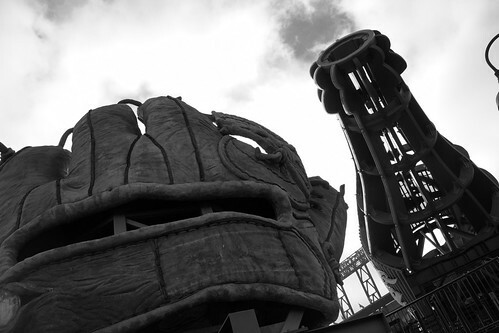 This entry was posted in baseball, family, gallery, Giants. Bookmark the permalink. I might be an Athletics fan at heart… but I’ve gotta admit… I truly enjoy going to a Giants game at least once or twice a year. AT&T is such a beautiful ballpark. Oh man, I love it! Reminds me of when I first went to the Dome with my dad. 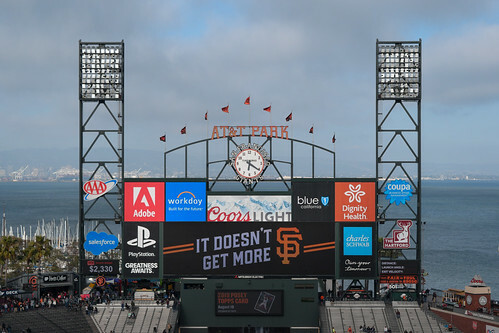 I’ve been to several ballparks, but AT&T is one of the top three that I’d like to get to – Camden and Fenway (just for the history, really) being the others. I was a bit bummed that I wasn’t able to make it there when I was in California last summer, but no one on my crew wanted to take the trip up from San Jose with me.